MainAll NewsUS & CanadaNearly half of US states oppose BDS – thanks to Bal Harbour? Nearly half of US states oppose BDS – thanks to Bal Harbour? Minnesota became 19th state to ban BDS, with 3 more on the way. Florida village Bal Harbour was the first town to oppose BDS, 18 months ago. Minnesota Gov. Mark Dayton has signed a bill banning state dealings with companies that participate in the Boycott, Divestment and Sanctions anti-Israel movement. Dayton's signature comes ten days after both houses of the Minnesota state legislature passed the bill by overwhelming votes. Minnesota is now the 19th American state to ban dealings with BDS-compliant businesses. Three others – Kansas, North Carolina, and Louisiana – are expected to pass similar legislation in the near future. As the anti-BDS movement gathers steam, it is fascinating to note that the first United States municipality to pass laws against supporting the anti-Israel boycotts was none other than Bal Harbour, Florida (population: 2,700). In fact, its current mayor, Gabe Groisman, wrote the original legislation when he was still just a town councilman, back in December 2015. The results of that precedent-setting move were clearly evident very soon afterwards, when the Church by the Sea was inspired to buck its parent organization and "unequivocally repudiate and reject" the latter's plan to boycott and divest from Israel. It happened as follows. Five months before Bal Harbour passed its pioneering resolution against anti-Israel discrimination, the evangelical umbrella organization United Church of Christ (UCC) passed a resolution essentially calling on its members and churches to join the BDS movement. Nearly a year later, a UCC member church called Church by the Sea asked to build a facility in Bal Harbour. Councilman Groisman immediately sense and opportunity. He invited the Church by the Sea's ministry to speak with him to discuss whether it could and would be willing to divorce itself from its parent church on this issue. Lo and behold, after several discussions with Groisman, the Church by the Sea did exactly that. It issued a letter, unanimously approved by its board, stating, "The Church by the Sea unequivocally repudiates and rejects the [UCC] Resolution's call to boycott and divest." Putting its money where its mouth is, the Church also withdrew all of its investment funds from the UCC Funds – over $2.9 million! The Bal Harbour resolution was a watershed in other respects as well. As Groisman himself later said, "Bal Harbour has a history of discrimination, which residents of years past fought hard to change. There was a time where African-American and Jews were not permitted to even own homes in Bal Harbour. Thankfully, these practices have changed, and Bal Harbour is now a symbol of diversity and success in the State of Florida." He then referred to the "bigoted campaign to delegitimize the democratic State of Israel, through a movement called BDS… Make no mistake about it, the BDS movement is a global propaganda campaign against Israel, that serves as thin cover for anti-Semitism - the levels of which we have not seen in the Western World in over 60 years… Bal Harbour has now made its citizens’ voice heard. Our city will continue to be a leader in the State of Florida and in the Country in fighting against discrimination and bigotry; not just in business and tourism, but also in social issues of the day, such as BDS." Zionist Organization of America's Sharona Whistler, director of the organization's Florida chapter, also said at the time, "What is the goal of the BDS movement? It’s the destruction of the Jewish State! That’s why BDS will fail…because Israel isn’t going anywhere! If the pro-BDSers really cared about the Palestinian Arabs and co-existence, they would be supporting Israeli businesses. Because it’s the Israeli businesses that are giving Palestinian Arabs the best jobs… If they really cared about co-existence, for starters, they should be aiming their vitriol towards Palestinian Authority president Mahmoud Abbas, who has said there will not be a single Jew in a future Palestinian State. " 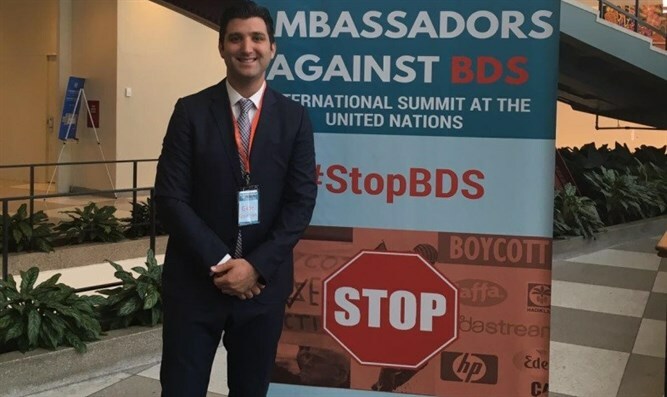 Whistler, too, recognized the pioneering efforts of Groisman, noting that he was "at the forefront in getting anti-BDS regulations in place for any corporation that wants to do business with the city of Bal Harbour. Similar to the law that was passed by the State of Florida, you can’t do business with Bal Harbour if you support BDS. Because of Gabe, Bal Harbour was the first city to pass such legislation." Joseph Sabag, U.S. National Director for Israel Allies Foundation, emphasized the importance of giving the anti-BDS campaign its first push: "Gabriel was the leader out on the front line there, not knowing what the opposition would look like and in the face of the constant barrage of propaganda and outright lies about Israel... This brought into motion the follow-the-leader effect, as many have now followed in his footsteps and are still going strong and growing stronger in the fight against BDS dangerous agenda to try to isolate Israel economically." Dr. Shmuel Katz of Stand With Us agreed: "The BDS movement and the radicals behind it threaten all of us, and we must therefore all unite in exposing and deploring it."